Langford GA. Yannoutsos N. Cozzi E. Lancaster R. Elsome K. Chen P. Richards A. White DJ. Production of pigs transgenic for human decay accelerating factor. Transplantation Proceedings. 26(3):1400-1, 1994 Jun. Cozzi E. Langford GA. Richards A. Elsome K. Lancaster R. Chen P. Yannoutsos N. White DJ. Expression of human decay accelerating factor in transgenic pigs. Transplantation Proceedings. 26(3):1402-3, 1994 Jun. Lai L. Kolber-Simonds D. Park KW. Cheong HT. Greenstein JL. Im GS. Samuel M. Bonk A. Rieke A. Day BN. Murphy CN. Carter DB. Hawley RJ. Prather RS. 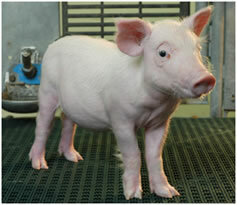 Production of alpha-1,3-galactosyltransferase knockout pigs by nuclear transfer cloning. Science. 295(5557):1089-92, 2002 Feb 8.